Teachers love a great resource! Especially a resource that is free and at their fingertips - literally. That's why I put together a list of 10 outstanding websites that teachers can use in the inclusive classroom (or any classroom, for that matter!). It was difficult to narrow the list down to 10, given all the websites that are available on the internet! However each site listed was chosen for content that I feel is unique or more substantial than what others had to offer. And, finally, these sites are in no particular order. They are all excellent and will provide teachers (and parents) with the resources to provide the best possible education for learners in the inclusive classroom. 1. BCTF - Teaching to Diversity - this website has both American and Canadian content. 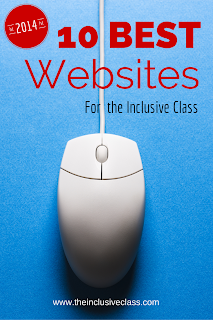 It offers resources that cover all aspects of the inclusive classroom. The resources vary from articles to checklists to worksheets. It also covers children who are gifted or have a second language. This site stands out in its effort to provide support for parents. There are numerous links to information, advocacy, and support groups! 2. Government of Alberta Special Education Resources - here is a website that offers very thorough and comprehensive information on ways in which teachers can support different types of behavior and/or medical conditions in the classroom. It also has a digital resource that provides strategies to support students in social situations while in school. Other online documents include information about transitions, individual education plans and ways to include indigenous populations in the classroom. 5. Do 2 Learn - you can spend hours looking at this site! It provides thousands of pages of social skills, songs, behavior support, cue cards, academic material and transition guides for employment and life skills. It is easy to navigate and free. Resources are designed by educational and clinical experts that are evidence-based and proven to work! 6. Inclusive Schools Network - not only is this site useful for educators and parents, but for schools as well! It has a unique self-assesment tool that allows schools to identify the success of their inclusive practice. In addition, the organization sponsors a national Inclusive Schools Week in December and provides ideas and materials (Celebration Kit) for schools to use. 7. National Center for Learning Disabilities - This site has become a leading resource for parents, students and teachers wanting to know more about learning disabilities. It features articles, assessments, podcasts and more that provide up to date information about learning and related disabilities with best practices for support. 8. CAST (Center for Applied Special Technology) - this website is home to information and tools to implement Universal Design for Learning in the classroom. In particular, the Learning Tools section has an interactive feature that allows users to create their own books and lessons that meet the needs of various types of learners. An extremely helpful resource for differentiating your instruction. 9. The Organized Special Education Teacher - there are not many websites that I have seen that are this organized! An American-based site, it is home to a plethora of resources for teachers. In addition to an excellent section on accommodations and modifications, it also has links to American Special Education laws and the Department of Special Education. 10. EdTech Associates - where can you find the latest and greatest information on assistive technology? On the EdTech Associates website there are links to education web tools, research and digital text books. Also, you can sign up for a newsletter that announces the "Best of the Web" where teachers can get information on how to provide their students with applications that can enhance learning and "level the playing field". Just had a chance to add them in! Thanks for letting me know! !